You may recall the show “Extreme Makeover: Home Edition.” The premise? Designers race to fully renovate a house in just one week. Onscreen, the results are spectacular, but pull back the curtain and the cracks begin to show – literally. With just seven days to complete the renovation, quality is bound to take a hit, and it has: Families featured on the show have complained of inadequate insulation, crumbling tiles, and bursting pipes. Faced with these problems to the inner workings of the house, the appearance of the home hardly matters. When you build a house, you need a strong foundation. The same goes for a hospital service department. Your team simply cannot perform at peak levels unless you first lay down the proper framework for operations. The consequence of not doing so? Team productivity, efficiency, quality, and patient satisfaction can all suffer. With the pressure of the daily “to-do” list in a hospital environment, it can sometimes feel like your service team is struggling just to stay afloat. The thought of slowing down to implement an “extreme makeover” of your operations strategy can seem daunting. Luckily, it is possible to get your house in order among the chaos with a simple operations framework that I’ll share with you here. Unlike the show “Extreme Makeover,” I’ll share tips on how you can take the time to properly implement it as well. I’ll also show you real-world examples of how the framework can build innovation into your service department. To strengthen your service team’s performance, you’ll need to formulate a plan. This framework will help you do just that. Like a house, this framework has many levels: a foundation (Level 0); a ground floor (Level 1); a second floor (Level 2); and a roof (Level 3). Each side of the house is divided into two sections: the managerial side and the technical side of your department. And, just like a real house, the upper floors have no chance of staying upright if the lower floors aren’t sturdy. 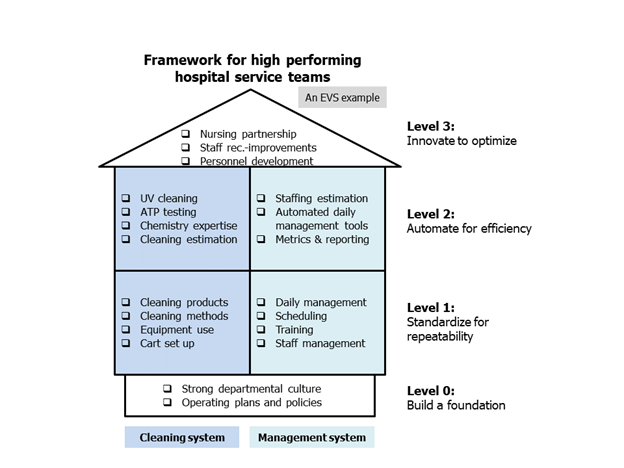 In the image of the framework above, an Environmental Services (EVS) department is the focal point, although this framework can be modified to fit other hospital service departments as well. To make the most of this framework, you’ll need to start at the bottom with the basics and work your way up from there. I’ll discuss how to navigate that next. Level 0: Starting at Level 0, this is where operating plans and policies are documented. This is truly foundational, so it’s next to impossible to move forward without first establishing this level well. Here, you’ll do things like implement operating plans and policies and create a strong departmental culture. Level 1: Level 1 is home to repeatable business processes. Here, you’ll start getting into the swing of daily routines, establishing standards, and identifying where you might improve later on. For example, as an EVS team you might specify which cleaning products should be used and how cleaning carts should be set up. Level 2: Once you reach Level 2, you can begin to automate processes and gain efficiency in the standards you built in Level 1. This can include things like utilizing metrics and automated reporting to analyze quality, efficiency, and productivity, which will allow you to see which areas need improvement. Level 3: At Level 3, you can start reaching out to customers (for example, nurses, physicians, and partner departments) to find out what’s important to them and what will help them excel. You’ll also be able to start identifying high-performing personnel on your team and advancing them into senior positions in order to build an enduring department. It’s worth noting that very few hospitals reach Level 3 — it can take many years for even the most advanced hospitals to get there. Here, you can truly innovate operations and become a leader in your area of specialty. There’s more to the framework than the different levels, though — also consider each of the two columns (the left and right side), which represent the technical and managerial sides of the department. Department leaders will almost always be more comfortable with one of two sides. For example, one leader may have an extensive background in cleaning (the technical side of an EVS department), while another may have more experience in managerial operations. For example, if the director of an EVS department is an expert in management, he or she will need a second in command that knows cleaning inside and out. If the director is an expert in cleaning, he or she might need an analyst on the team that comes from an MBA program and can bring that experience. The framework is not just a theory – it’s a proven process. This is something I was able to implement fully during my time at the University of California-San Francisco (UCSF) Health, where I helped to establish operations for the Environmental Services department at the newly built Mission Bay campus. By moving through the framework from Level 0 to Level 3, we were able to not only implement the foundation, but also innovate with technology that further advanced our workflow. I’ll talk about the technology piece next. After establishing a strong foundation, we wanted to improve the team’s communications. One tool we used to do this was Voalte, a healthcare communications platform that allows hospital staff to communicate with one other quickly and easily via smartphones (for example, through text messaging). A lot of communication in healthcare isn’t so urgent that it requires an immediate phone call. Usually, responding within 15 to 30 minutes is more than adequate such that a simple text message can get a request going. When UCSF Health’s Mission Bay campus implemented Voalte, we saw a significant decrease in call volume, talking, and noise, as well as a marked improvement in communication. Together, those two changes enhanced the experience of both staff and patients. We identified a second area we could streamline by outsourcing basic tasks. We implemented robots at the medical center – TUG robots from Aethon. In practice, this meant deploying 27 robots that were capable of carrying food, medical supplies, and other items from place to place. They never call in sick, they’re very consistent, and they never get tired of walking. Each robot works 60 hours per week and travels 12 miles per day, which comes out to about 300 miles per day for the entire fleet. Instead of having someone on the team push a cart from food services to the patient’s room, the robots do the legwork and the service team on the receiving end takes the food tray to the patient. This allows the staff to focus on serving the patient– the human part of the healthcare equation. Finally, we knew we could become more efficient at patient room turnover. At UCSF Health’s Mission Bay campus, we use checklists in a modern and efficient way to eliminate unnecessary, tedious tasks and improve both patient and staff satisfaction. Our application, ReadyList, is based on these checklists and empowers nurses to spend their time doing what they do best: caring for patients, rather than cleaning rooms or hunting down missing equipment. The process of setting up a patient room to have everything that it needs is seemingly easy but deceptively complicated. The ReadyList application’s ability to streamline the process and draw service teams together enables nurses to start caring for patients right away. Anyone who works in healthcare knows that each day in a hospital is filled with tasks that need to be completed, problems that need to be solved, and fires that need to be put out. The thought of taking on a big-picture project is a daunting one. But, if you take the time to re-examine things from the ground up, you’ll be able to do more than just keep your head above water — you’ll be able to glide through the day. Make time: Before you do anything else, you need to build time for yourself and take a step back from day-to-day operations. To do this, you’ll need to first empower your front-line managers to take on the everyday tasks. Then, they’ll have more accountability and responsibility, and you’ll have the freedom to focus on the big picture of making your department run better. Take stock: Take a good, hard look at your service team and evaluate its performance from Level 0 all the way up to the roof. Note where there’s a lot of room for improvement, where things are on the right track but not quite there yet, and where everything’s looking pretty much perfect. Make sure to pay special attention to Levels 0 and 1, which will form the foundation of your entire department. Start planning: Now that you have a clear picture of what needs to be reworked, you can take the assessments you’ve made and use them to start developing a high-level roadmap. For example, if you have significant gaps in Levels 0 and 1, design a plan that will allow you to spend at least one year filling those gaps. Or, if Levels 0 and 1 are already solid, allocate six months to work out any small issues before moving on to Levels 2 and 3. 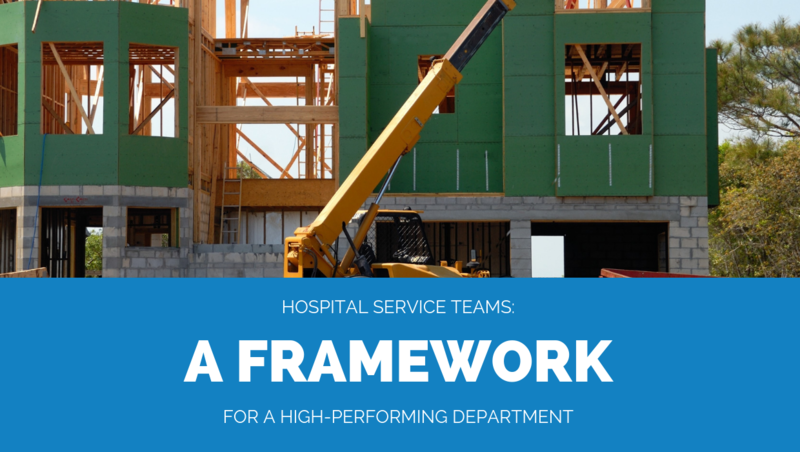 At the end of the day, building a high-performing hospital service team is no different than building or remodeling a house. Before you start thinking about the finishing touches, you need a sturdy foundation and framework. Although this process can take time (years, even), it can also lead to exciting opportunities to automate, innovate and get creative later on – and most importantly, make a real and positive difference for your department, your staff, and your patients.